Wall-hugging, space-saving design is ideal for areas where space is at a premium. Half-round waste receptacle offers a heavy-gauge steel construction, black powder-coat finish and metallic accents. Protective vinyl trim surrounds disposal opening. 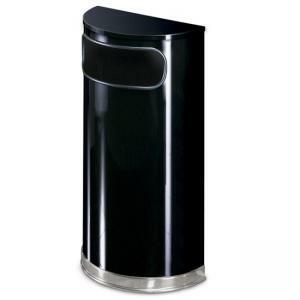 Waste receptacle features a leakproof rigid plastic liner and 9 gallon capacity. Receptacle is made with 30 percent recycled material and is 100 percent recyclable.